I know what you’re thinking. You’re thinking “Damn, I miss the Nissan Murano CrossCabriolet. I want something similar but smaller and with a German badge on the front.” For the few of you weirdos actually thinking that, there’s great news! Volkswagen’s got just the car for you! With the departure of the Coveted But Not Really Nissan Murano CrossCabriolet, the Range Rover Evoque is left as the only convertible crossover money can buy. 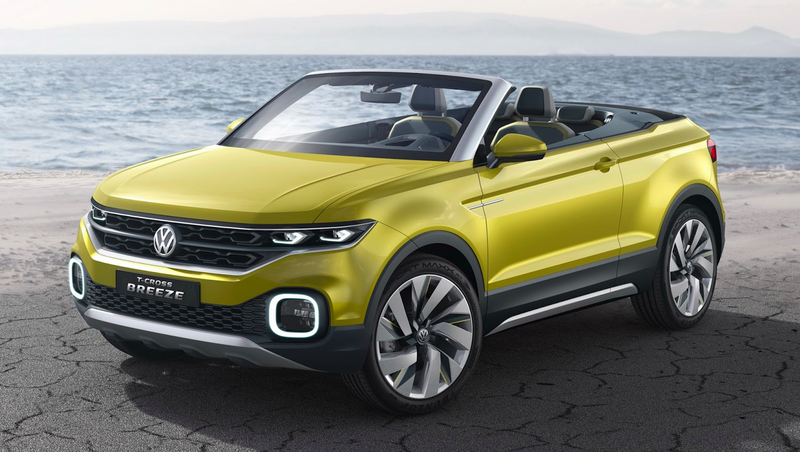 But VW might want a piece of that probably-very-small convertible CUV market, because at this year’s Geneva Motor Show, the Germans are taking wraps off a convertible lifted hatchback called the T-Cross Breeze concept. We don’t have much information on the T-Cross Breeze, but Autocar opines that it’s built on the next-gen Polo MQB platform and that it may show up in 2018 slotting under another Golf-based crossover inspired by the T-Rock concept. Both cars would slot under the Tiguan and compete with baby CUVs like the HR-V, Q3 and Mazda CX-3. If it’s priced reasonably, this could actually be a lot of fun, as the Evoque costs over 50 large, and the CrossCabriolet’s problem was, well, that it was eye-searingly hideous. This isn’t hideous. This is actually kinda nice.